Now PlayingClip | "Cheek to Cheek"
Clip | "Cheek to Cheek"
Clip | Making Cheek to Cheek LIVE! Tony Bennett and Lady Gaga team up for a very special concert from the stage of Jazz at Lincoln Center’s Rose Theater in New York City performing selections from their collaborative classic jazz recording, Cheek to Cheek. The album debuted at #1 on the Billboard 200 Album chart and also hit #1 on the Jazz Album and Traditional Jazz Album charts. With the release of “Cheek To Cheek,” Bennett broke his own record, set in 2011 when “Duets II” debuted at #1 at the age of 85. Now at 88, Bennett remains the oldest artist in music industry history to have an album at the #1 spot on the Billboard charts. “Cheek To Cheek” marks Lady Gaga's third consecutive #1 album release in just over three years, making her the only female artist this decade to achieve this feat; this is the second time in Bennett's career that he has had an album debut at #1 in both Billboard's Pop and Jazz Album charts. Throughout the concert, Bennett and Gaga demonstrate a strong camaraderie and affection belying the six-decade age differential. Great Performances – Tony Bennett & Lady Gaga: Cheek to Cheek LIVE! was produced by WNET. Discover more content with Great Performances. 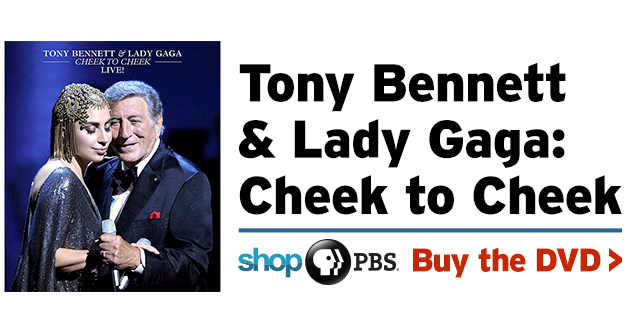 | Tony Bennett & Lady Gaga: Cheek to Cheek Live!